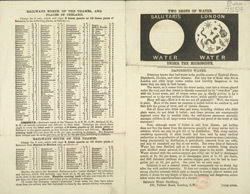 Piped water was in strictly limited supply in Victorian Britain, and in villages and rural areas particularly many people still had to collect water from public pumps and wells. London, Manchester and Glasgow all had badly contaminated water supplies up to the mid-century. This led, first, to a number of widespread cholera and typhoid outbreaks and eventually to the wholesale overhaul of municipal drainage in Britain. Despite the improvements in sanitation that resulted, many middle and upper class people continued to distrust the water supplies and bought bottled water from distilleries such as this instead.